The house is clean and modern, very nice, quiet country setting. Owner was very responsive and went above and beyond when we needed help getting the 10' projector set up... that's amazing too! Lots to do in the area, from hiking along the Delaware river, to top notch restaurants, notably The Heron and Hennings Local, where I had the best old fashioned ever. Hope to stay here again. The property was exactly what I expected.Beautifully designed and maintained.Modern simplicity at its best. Perfect for famliy or a girls weekend. Although its a small town theres plenty to do outside ,its not so far of a travel for a little adventure.Tubing down the Delware river was lots of fun. Definitely would come again and rent the same home. We were looking for a fairly new, clean, modern spot in the mountains and this place fit the bill perfectly. Everything works very well (very powerful range, good grill, amazing TV projector), it's set back in the woods a bit, and has a nice backyard with a fire pit. The owner is also responsive and makes everything easy. And it's a very quick drive (5, maybe 7 minutes) to "downtown" Narrowsburg, which has a coffee shop and a couple restaurants, and 5 minutes the other way to the Tusten Mountain Trail, which is a fun hike that starts along the Delaware, and a boat launch for canoes, tubes, etc that was quite popular when we were there. I rented the home for a week. The pics are quite accurate. The home is modern and clean. It has a great open layout with windows everywhere. You really feel that this is a vacation home. There are 2 patios- 1 with a grill which worked great. The other is a screened-in dining section. It was so relaxing to eat outdoors. The kitchen is fully stocked, as is the whole house. The beds are very comfortable. And the showers are amazing. The home has a projector on which you can use Amazon Prime or Spotify. I am not good with IT issues, but even I was able to easily use the equipment. The owner is very responsive and seems lovely. We laughed that--- on the road in front of the home, we considered it a 'busy' day if we saw more than 3 cars go by the whole day. 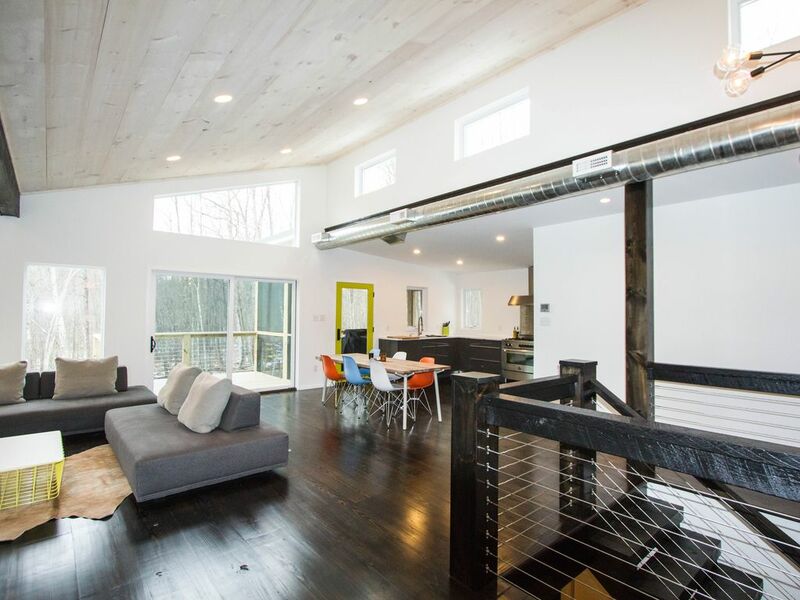 If you are looking for a quiet, clean, modern home, this is it. There is a cute green hummingbird who comes every day, attempting to enter the home. We were looking for a nice, peaceful stay outside of NYC, and were not disappointed. Beautiful, clean and well-stocked home with lots of indoor and outdoor space. We enjoyed using the the BBQ, the deck and outdoor area and loved the Media room. The kitchen is also great for cooking and the bathrooms include a very nice tub and a nice shower. The house offers privacy while not putting you in complete isolation. Beautiful home, well-designed to maximize space, and includes all the modern amenities. The home was well-stocked with cookware, towels, bedding, etc. and the space is clean. We enjoyed using the fireplace (thanks for including some starter logs). Although we had 7 people, the place never felt cramped, and we had lots of space to lounge around and relax away from the city. The home is within 20-30 mins driving distance to a few rustic towns including Narrowsburg, Bethel, and Milford. Great for antique shoppers. Also good for those looking for privacy as the lots are quite large in this neighborhood. I would definitely rent out this space again - thanks again for such a great space.